The motor cycle helmet is in accordance with the testing standard DOT and can therefore be used throughout the USA. The R2 is available in sizes from XS to 2XL. This conforms to head circumferences from 52 to 63 centimetres. 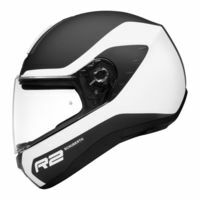 Wind deflector for the Schuberth R2 helmets.